Typewriter Keyboard allows you to make your keyboard play typewriter sounds or any other sounds. You miss your old typewriter? You want your Mac to play typewriter sounds when you press the keys of your keyboard? 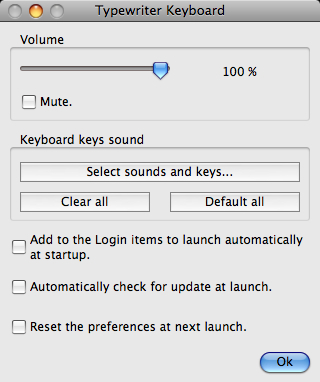 You even want your keyboard to play any other sounds? Then Typewriter Keyboard is what you need! - It plays typewriter sounds when you press your keyboard keys. - You can replace the typewriter sounds by any of your own sounds. - A free and growing library of new sounds is available. - You can adjust the sound volume. - You can activate or mute it with the global hot key combination Control-Alt-Command-T.
- It is available in Dutch, English, French, German, Greek, Hungarian, Italian, Japanese, Korean, Norwegian, Polish, Portuguese, Russian, Simplified Chinese, Spanish, Swedish, Traditional Chinese and many other languages.